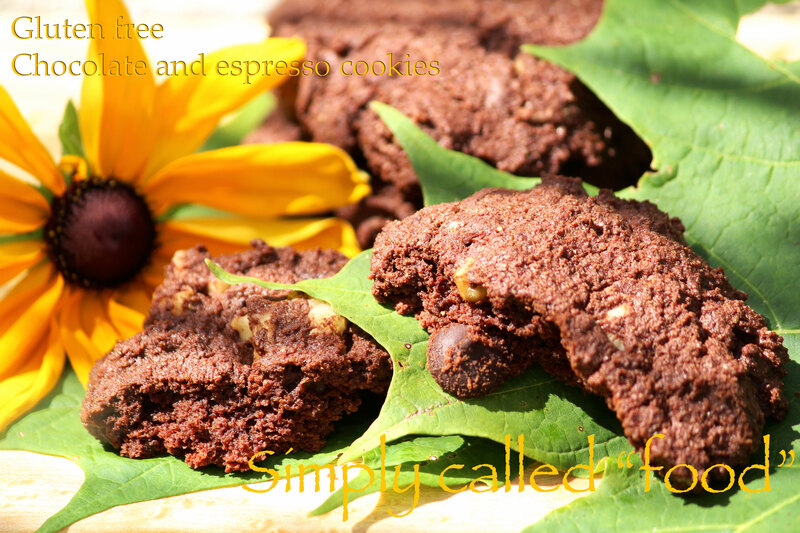 Gluten free chocolate and espresso cookies | Simply called "Food"
Like a lot of people, I’ve been enjoying the heat of the summer for the past few week. Cooking a bit but not much, gardening and just relax. That’s why I haven’t been writing much, but I still have ideas in my mind. Slowly but surely getting back in my routine and thinking of our new homeschool year, meaning that I also have to plan the curriculums. But it’s still summer and my kids still need to eat. I am also on vacation, so I went for already prepared snack from the store. Healthy though :-), but they were missing my homemade food. At least I know they appreciate it, which is always good to know. I was looking for coffee cookies, but I only found recipes with instant coffee in them, something I didn’t have so I decided to make make my flax seeds mix with coffee, and it turned out good. Those are also VERY chocolaty! I got inspired my Martha Stewart’s recipe but as usual I changed a few things. In a small bowl, combine the flax seeds with 6 tbsp. of espresso coffee and set aside for more or less 10 minutes. In another bowl, combine the rice flour, the coconut flour, the arrowroot starch, the baking powder, the baking soda, the salt and the cocoa powder. In a bigger bowl, cream the butter and the sugar. Then gradually add in the flour mix, the melted chocolate, the vanilla, the rice milk, the chocolate chips and the walnuts. On a cookie sheet, make your cookies (you might have to make two sheets) and place it in the oven. Cook them for approx. 15 minutes. Remove them from the oven and place them on a wire rack for 10 minutes to cool down. Tags: Chocolate, coconut flour, Cookie, Food, Gluten free, Nuts, Recipe, Snacks, Vegan, Walnut. Bookmark the permalink. Pingback: Organized Single-Serve Grown-up Snack! | It's Tidy Time!